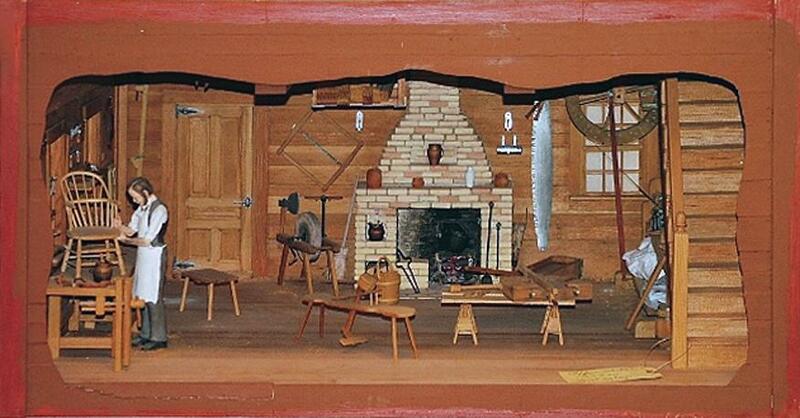 The diorama of William Haldane’s Cabinet Shop, which began in 1837, depicts Haldane attired in a work-apron while working on a hoop-back Windsor chair. A large fireplace dominates the room where various tables, small wooden items, a spinning wheel, and furniture tools can be seen. The wooden siding and post at the far right represent the exterior of the building. An identification tag in the lower right foreground provides some size comparison to the furniture pieces. There is a hoop-back Windsor chair, attributed to William Haldane, in the Grand Rapids Public Museum Permanent Collection. The size of the diorama is: 24 in. high, 38 in. wide, 29.5 in long.